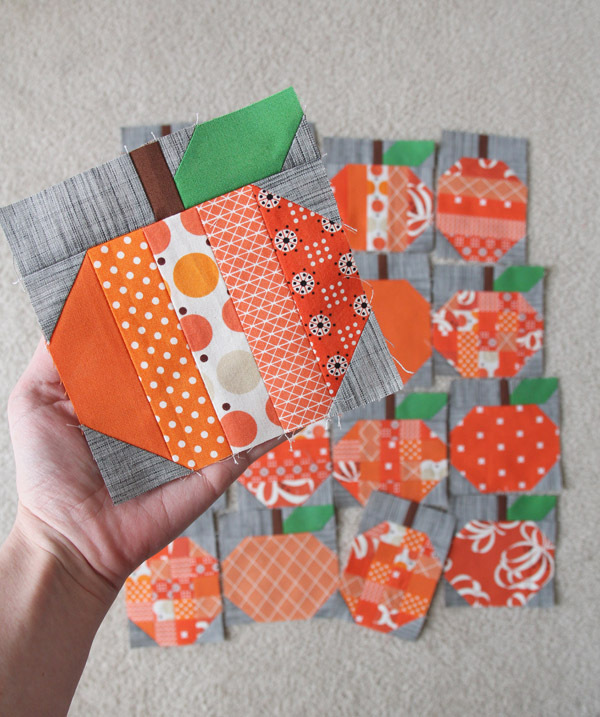 I caught the Pumpkins bug from seeing all the amazing Pumpkins Quilts on Instagram here. 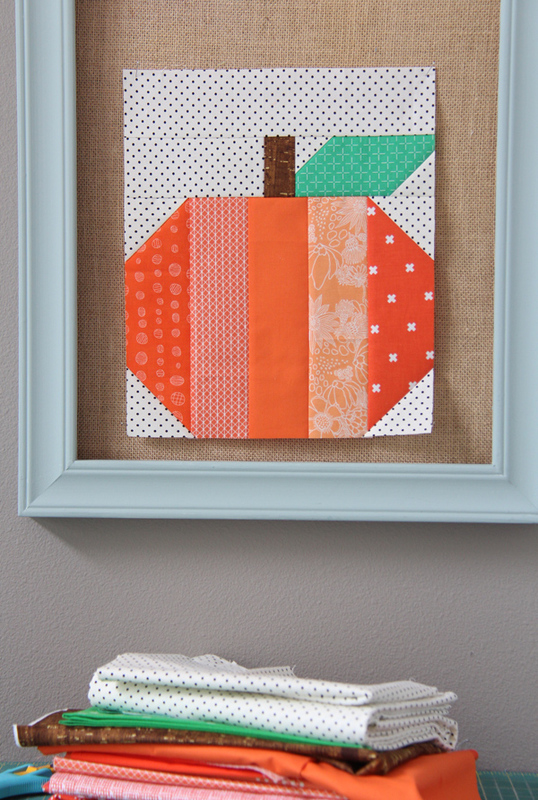 My first Pumpkins quilt travels around to hang in shops this time of year…so I need one to keep at home. Preferably with a soft fuzzy backing! This time I’m going to use more oranges to make it scrappy, and I’m using this cream and black swiss dot fabric by Riley Blake as the background. Last time I used the Moda Crossweave in Graphite, and I’m still torn whether I like the dark or light backgrounds best with this quilt! If you catch the Pumpkins bug too, the PDF of the pattern can be found here, Paper version can be found here. The Mini Pumpkins PDF can be found here, Paper version can be found here. There is no such thing as too many pumpkins this time of year! Except last year I tried the Pumpkin Spice Cheerios…they were super gross (sorry Cheerios). So besides in my food…give me all the pumpkins! Thanks Roseanne for making me feel more justified in making another Pumpkin quilt LOL! I agree…I love both backgrounds too! I loved your presentation at the Eastside quilters guild. And now I am doing the basketball quilt from your pattern for my grandson. I love it! 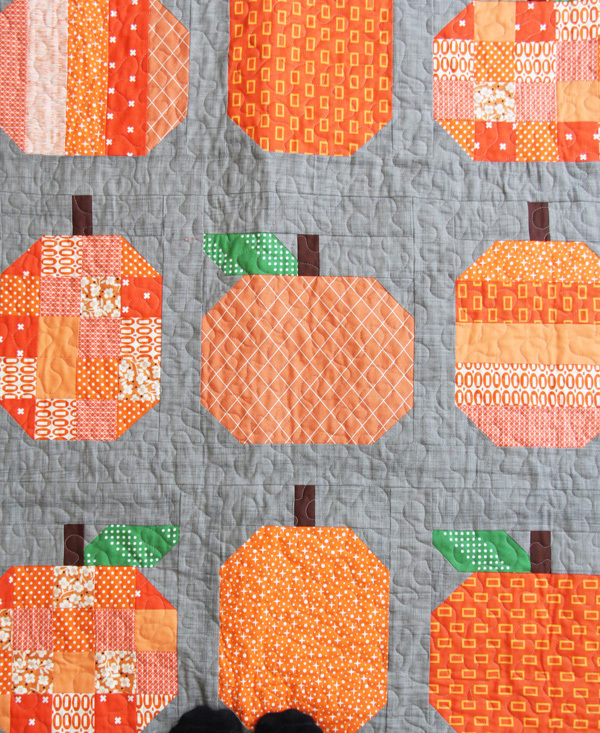 One of my favorite seasonal quilts ever! Love this pattern so much! (And I’m with you…I thought the same thing about pumpkin Cheerios, so bummed. You know what was worse though- Chobani’s pumpkin spice yogurt! So gross. Yeah, my love for the season holds strong but I am going to stick to homebaked good when it comes to pumpkin spice! LOL! I draw the line at Pumpkin Spice yogurt…I’m glad you tried it so I don’t have to. Thanks for visiting! I love these so purchased both patterns last year, and fabric to make them – then life happened and didn’t get started. But I did spend the year collecting an assortment of orange prints so I can make a scrappy version. Guess I better get started so I can enjoy them this year! Gayla, I think orange prints are the most difficult to find. I’m glad you had success and also understand why it took a year. What fun it is to look for something specific whether it be a theme or color. Right now I’m looking for birch fabric to cover a lamp shade! I despise everything pumpkin spice flavored, but I love your quilt! Need to put it on my to-do list. So excited about this pattern, had to get both sizes! Just out of curiousity, are the block sizes different for the mini and large quilt patterns? I have the mini, purchased last year, but now think I’d like to make a larger quilt. Mindi, They are two different patterns. The larger one has larger different sized blocks. Both are wonderful. Sorry for the late reply Mindi! Yes the normal Pumpkins pattern is 10″ blocks, the smaller “mini pumpkins” is 5 or 6″ blocks I believe…more of a small wall hanging size. Thank you for this wonderful post. I too am , up to my neck in wonderful bright orange awesome fabric. I love both of your Pumpkin patterns. Right now I’m going to cut an extra row, on the mini. You are so generous, Thank You. Love your quilts! I made pumpkins mug rugs yes at least 12 to give away and everyone loves them! I want to make place mats and even a quilt one day and yes love the gray background, the polka dots too! How cute! 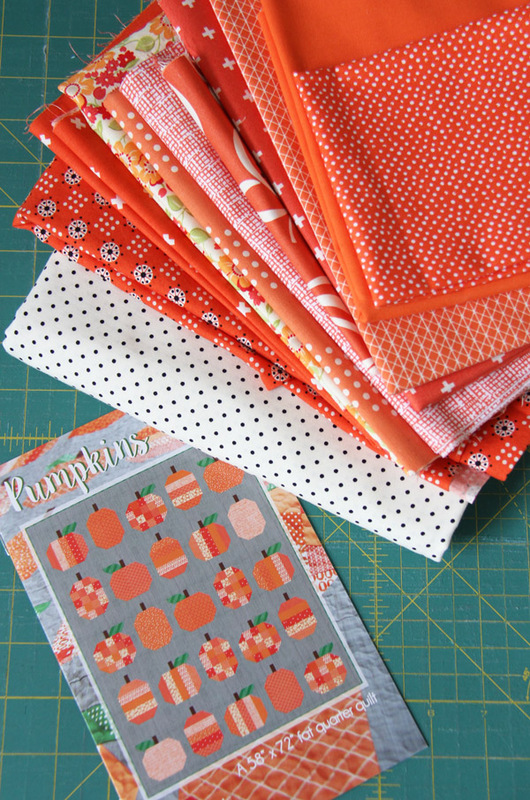 I’ve seen pumpkin place mats and they are adorable! Every year I think I should make them!